Norway’s Magnus Carlsen won the World Chess Championship for the third time, seeing off Sergey Karjakin, a Russian grandmaster. Carlsen, the world’s top-ranked player, has been world champion since 2013. He became a grandmaster at the age of 13 and turns 26 on Wednesday. Karjakin qualified as a challenger by winning the 2016 Candidates Tournament. The World Chess Championship was played in New York, between 11 and 30 November 2016. The match format was best of 12 games. After seven consecutive draws, Karjakin won the eighth game. 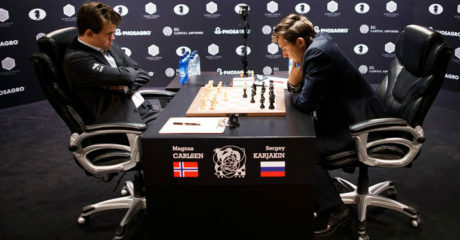 Carlsen evened the score by winning the tenth game. All other games were drawn, leaving the match at a 6-6 tie, meaning that tie breaks were to decide the match. Carlsen won the four-game rapid chess tie break 3-1, with wins in the third and fourth games, to win the match and retain the title of World Chess Champion. The opening ceremony for Rio's Olympic Games got under way Friday evening with a roaring crowd of tens of thousands in Rio de Janeiro's Maracana Stadium and a pop song expressing love for Brazil.